If your child expresses fear, sadness, etc., have them notice where they feel it in their bodies. As them to jump around, shake or do what their body needs to do. Encourage your child to rest, even if they don’t want to—not necessarily sleep, but time with a book, playing with stuffed animals, doing art for example. For some children, drawing is very relaxing and sometimes by drawing, they can then talk more about their fears. Try not to analyze their drawing, just be there with them and watch their body reactions. You might ask them to draw a picture of the place in their body where they feel their and anxiety. Even though children pick up our anxieties, try to keep talking about scary situations at a minimum around children. And even though it is difficult, avoid having the TV on all the time, try to catch up on news when they are playing elsewhere. 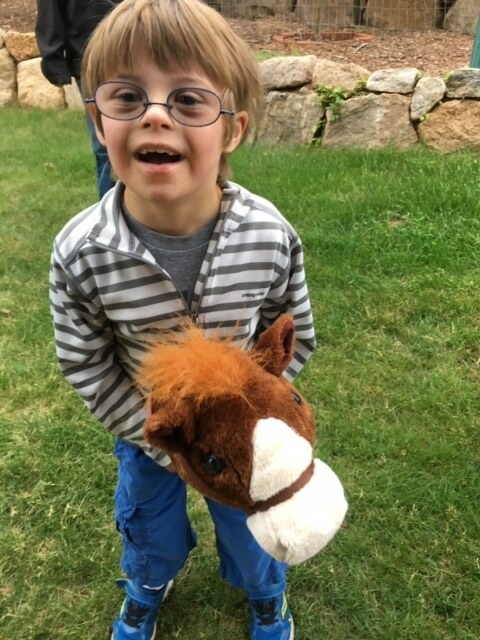 Try to have come time each day that feels normal to your child, even if someone else needs tone the caregiver to help with that. 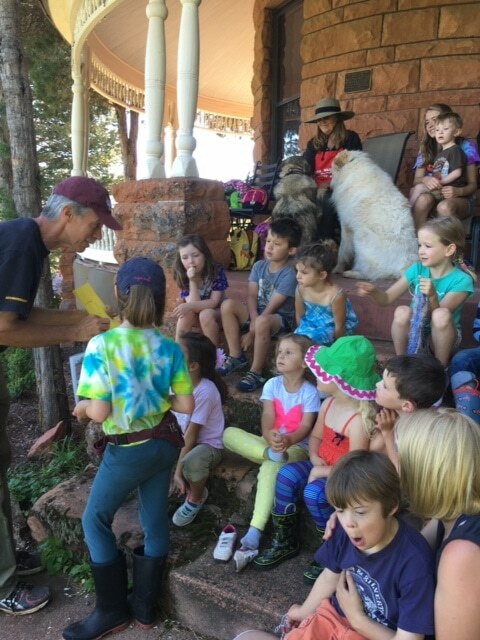 A trip to the park, reading a favorite book, or taking advantage of story time at the public library. 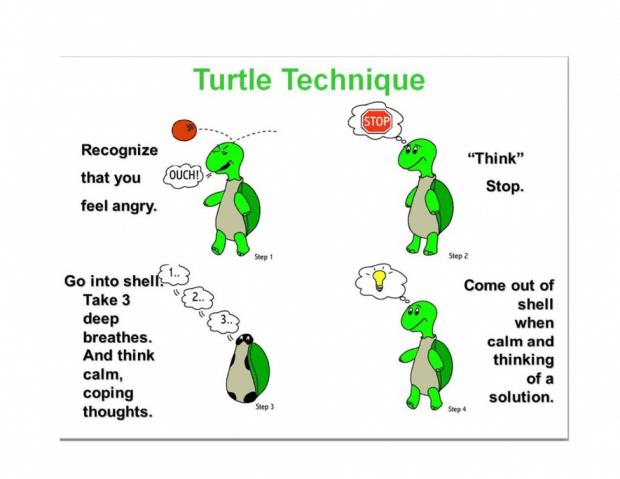 The Turtle Technique is a relatively simple but powerful tool that teachers and parents can offer children to help calm them down in a variety of situations. I laugh thinking of our director Jen Filonowich who, after a staff training where we all learned and practiced the Turtle Technique, commented that she’s been using it herself! I like it too. 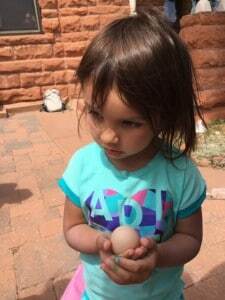 Please check out Center on the Social and Emotional Foundations for Early Learning (CSEFEL), the Technical Assistance Center on Social Emotional Interventions (TACSEI), and the SpecialQuest Approach for more resources. And then there is Rudyard Kipling’s letter to his 12 year old daughter who was preparing for a trip to London…. I send you a few simple rules for Life in London. 1 Wash early and often with soap and hot water. 2 Do not roll on the grass of the parks. It will come off black on your dress. 3 Never eat penny buns, oysters, periwinkles or peppermints on the top of a bus. It annoys the passengers. 4 Be kind to policemen. You never know when you may be taken up. 5 Never stop a motor bus with your foot. It is not a croquet ball. 6 Do not attempt to take pictures off the wall of the National Gallery or to remove cases of butterflies from the National History Museum. You will be noticed if you do. 7 Avoid late hours, pickled salmon, public meetings, crowded crossings, gutters, water-carts and over-eating. Having just sent our youngest Ruth Washburn alumna daughter off to New York City where she intends to pursue dance I wish my husband and I had written her a “dear bird” letter rather offer every possible reminder for safety that we have accumulated throughout life. So I haven’t mastered how not to worry, but I’m definitely better. A special thanks to Lois Arndt who has made helping others her full-time occupation. Teacher, Education Director and Assistant extraordinaire Karen Brown has been filling gaps at Ruth Washburn for many years in the best possible way. Karen starting teaching at our school in 1994. She brought professionalism, an expertise in Early Childhood Education, intentional teaching and many, many great themes and curriculum ideas that are still being used daily current teachers. When an Education Director was needed, Karen competently stepped into that role and helped to mentor and assess teachers. Most recently Karen has served as assistant in the Middle 3s class. Sadly for all of us who treasure Karen’s presence at Ruth Washburn, she is retiring. In Karen’s characteristically constructive way she and her husband David have donated the Wee Notes Ensemble as a retirement gift to the school. 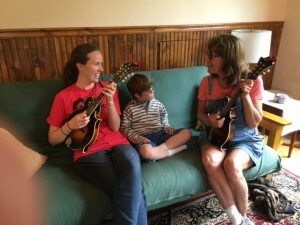 “I felt like there was a gap not having musical instruments outside and this seemed like a sturdy set that would last.” It will be very difficult to fill the huge gap left by Karen’s retirement, but we already love the music. Thank you Karen! Tracy and Jim Volpe, parents of Hannah (Outdoor Class) and Haelyn (alumna) also identified a need. 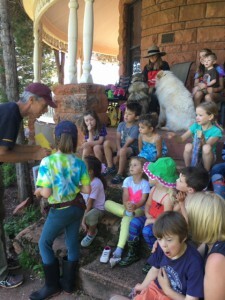 They recognized that a permanent outdoor easel would facilitate process art in a new setting. 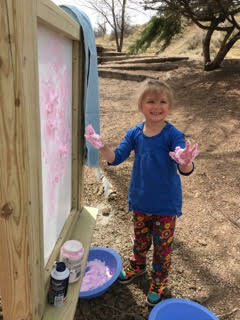 How appropriate that the first person to break in this wonderful outdoor easel was their art-loving daughter Hannah! 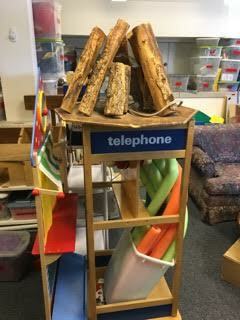 Hopefully every RW child will take a turn exploring art with this easel. And last but not least, we now have a nest swing on the Prairie paid for with fundraising event proceeds. 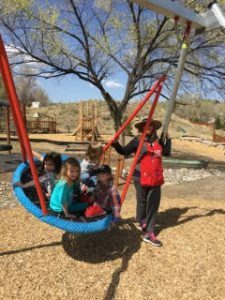 For several years teachers have talked about the benefits of and need for swings for young children. The nest swing brings us an open-ended play structure (“it’s a rocket” “it’s a giant pizza” “it’s a bed”) that encourages cooperation among children. It has been pure joy to watch children explore this new swing. Special thanks to our director Jen, her husband Aaron and son Hudson, and to Karen and David Brown for working overtime to acquire and install these new backyard play structures! Thank you to Kristin Schoonveld for a fun picture of Karen. 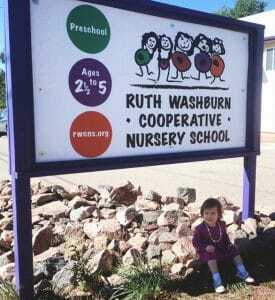 Ruth Washburn has many distinguished alumni parents. 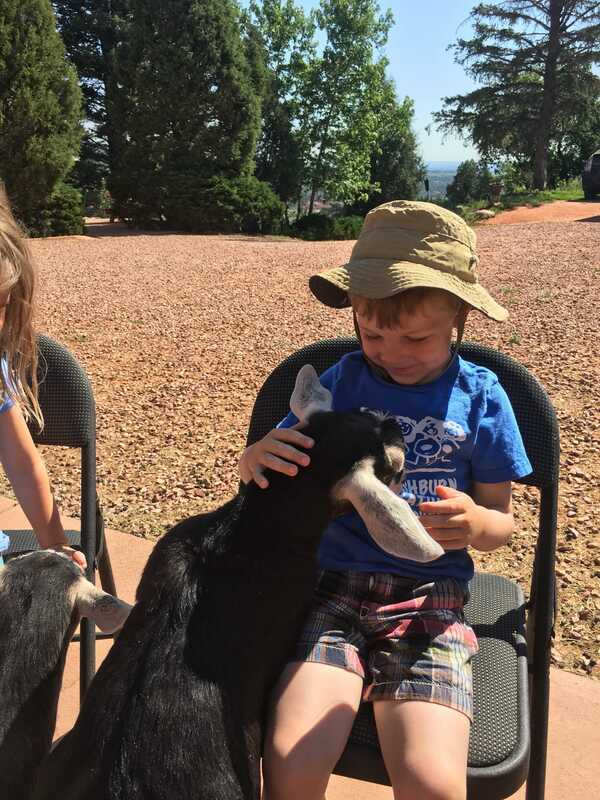 Nancy Maday, Children Services manager for the Pikes Peak Library District (PPLD) is one of those people. 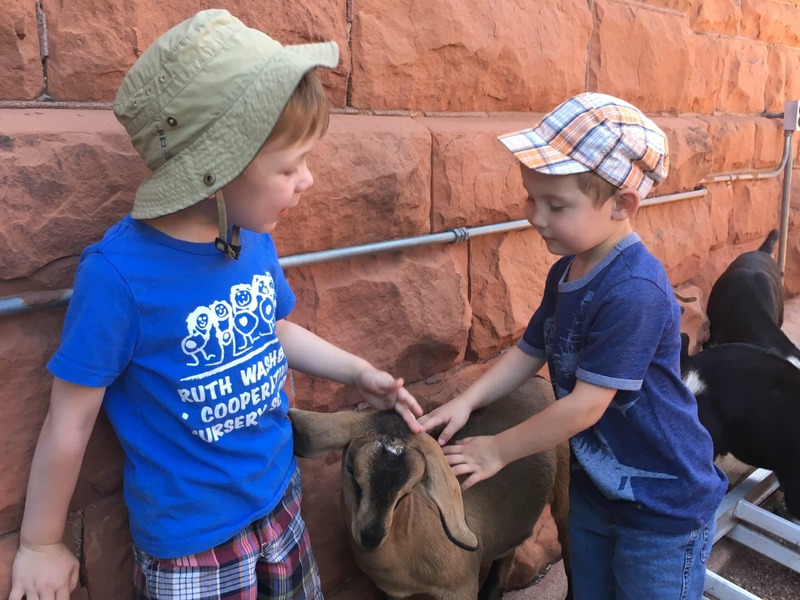 Both Nancy and her husband Mike have found ways to support Ruth Washburn many years after their sons graduated from the school. When talking to our teaching staff about the topics of books and reading, Nancy reminds us that there is a difference between teaching children to read and getting children ready to read. 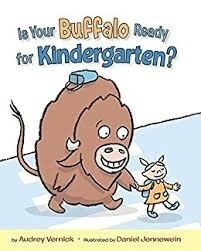 Our job as teachers and parents of preschool age children is getting children ready to read. 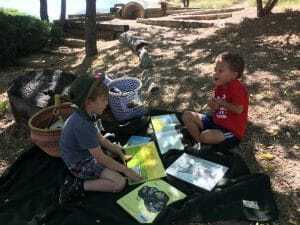 PPLD’s “Every Child Ready to Read” program emphasizes talking, singing, reading, writing and playing with children as effective ways to prepare children. 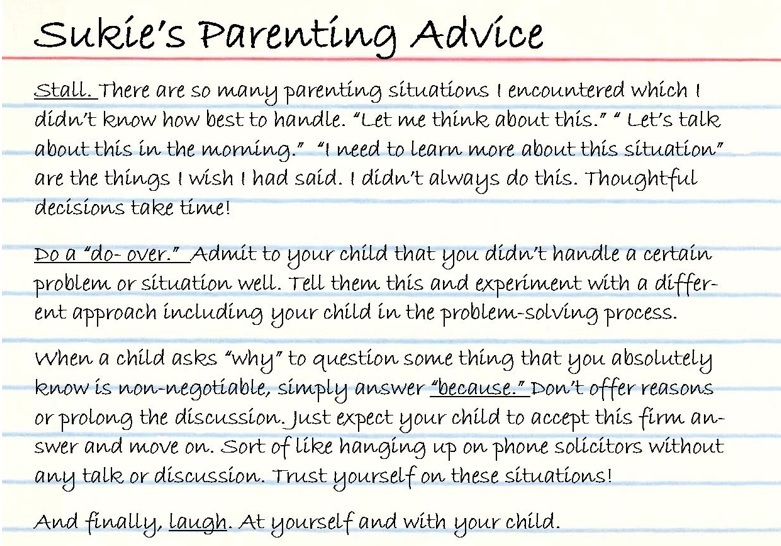 Nancy offers the following suggestions to parents and teachers. Make sure that your child has lots of opportunities to talk with you, not just listen to you talk. Songs are a wonderful way to learn about language Singing also slows down language so children can hear different sounds that make up words. Make shared reading interactive. Before you begin a book, look at the cover and predict what the book is about. Have your child turn the pages. Ask questions as you read aloud and listen to what your child has to say. When you finish the book, ask the child to retell the story. Talk to your children about what they draw. Write picture captions or stories together. This helps them make a connection between spoken and printed language. Children learn a lot about language through play. 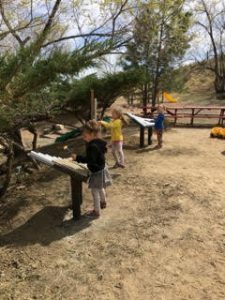 Play helps children think symbolically so they understand that spoken and written words stand for real objects and experiences. Have fun reading with children. If children enjoy books and reading, they they are more likely to want to read. Choose books that you enjoy too and repeat favorites. 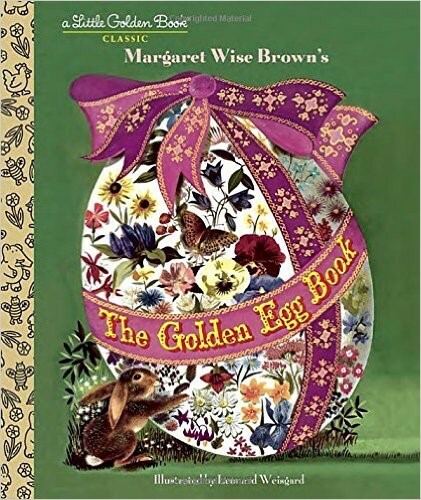 Our local library has many, many resources for parents of young children, two of which were created in collaboration with former and current Ruth Washburn staff members. Grow a Reader Kits. These are bags/suitcases filled with activities, books, toys and music related to a theme designed to promote literacy in preschool age children. 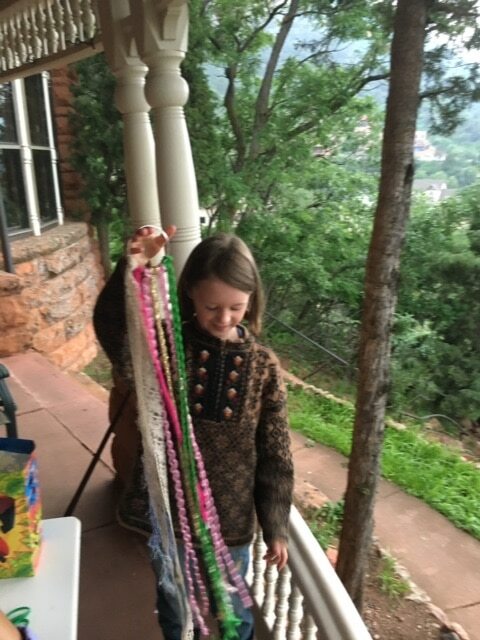 To see the kit themes and booklets go to the Pikes Peak Library District website. Click on PPLD Kids. Click on Grown Ups. Click on Early Literacy. Click on the theme of your choice. Theme Sets. 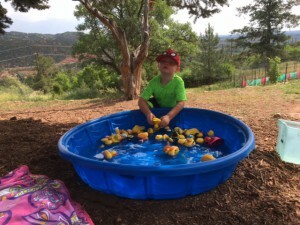 Search JTHEMESETS on the Pikes Peak Library District website. Each theme set includes four high quality, age appropriate books packaged together on one of over 50 themes including Friends, Kindergarten, Death of a Pet, Gardening, Rhyming, Colors, Divorce and Construction. Everyday Play in the Ruth Washburn Basement. An entire wall filled with process art materials including a set of baby bottles filled with colored water, fly swatters, sea sponges, golf balls, strawberry baskets and all kinds of brushes including scrub and toothbrushes. Homemade props. 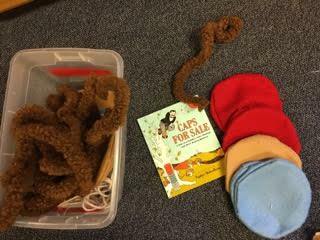 One example is the bin containing berets and monkey tails that are used year after year by RW children as they act out the classic story by Esphyr Slobodkina, Caps for Sale. What simple, grand props! Shelves filled with recycled items. 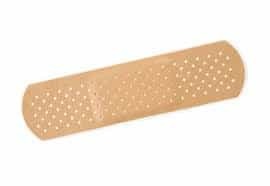 Corks, baby food jars, aluminum trays, paint samples, tiles, scoops, wire pieces, sytrofoam sheets, smooth stones, cardboard squares, egg cartons and so on. Parents in our cooperative are the perfect source for these materials that get used by children for tinkering, building and creating. Science bins including Weights and Measures, Pulleys, Bubble Wands, Sight and Sound, Beakers and Test Tubes. 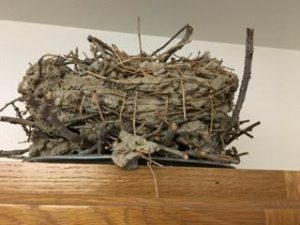 There is a bin with more than ten bird’s nests. Amazing! 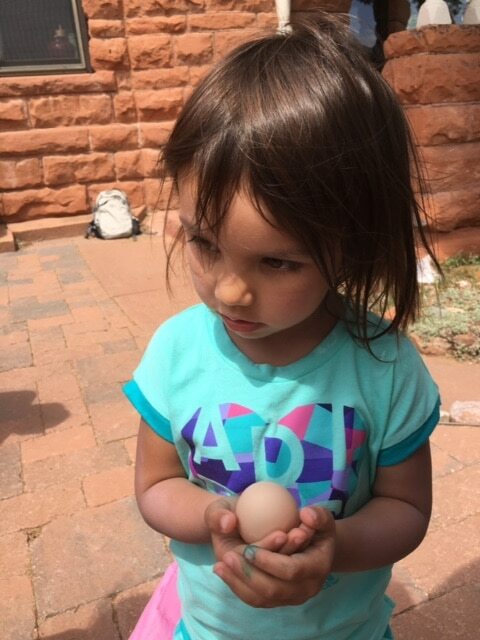 Shells, rocks, antlers, even a coconut can be unearthed from the many natural objects stored offering children the opportunity to study real objects. There is more. Paint, glitter, glue, costumes, hats, scarves. Oregon sand, keys, and popcorn. Multi-cultural musical instruments and a set of hand drums. A wooden train, a circus train. Foam, wood, cardboard and other blocks. Puzzles, magnetic builders, flannel boards and stories. Castles, barns, a space ship. 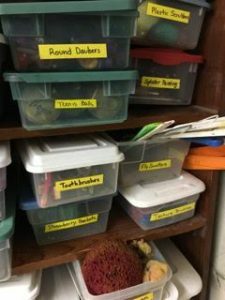 Ann Epstein in The Intentional Teacher recommends that teachers provide “sturdy, open-ended materials that children can use in many ways and reflect the diversity of their homes and communities.” This is just what we do with basement STUFF. “Children are particularly fond of haunting sites where things are visibly worked on. They are irresistibly drawn to the detritus generated by building, gardening, housework, tailoring or carpeting,” William Benjamin stated way back in 1924. 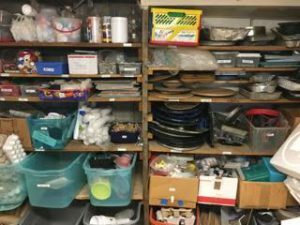 While our basement “detritus” isn’t generated by tailoring or housework, it is generated by good teaching. RW teachers, parents and children are “irresistibly” drawn to this school, in part, due to all the great STUFF in our basement that we use to facilitate children’s play and learning. If you haven’t yet been down to our basement, be sure to plan a visit. You will be amazed by everything there. Oh It Snowed Last Night! It is magical to wake up to a snow covered world! Here are some very simple and very fun snowy day activities with young children. Have a child fill a glass jar up to the brim with snow with a spoon. Ask the child to predict what will happen to the snow when you bring the jar inside. Check the jar periodically. It’s quite surprising to children what happens with this very simple experiment and it can lead to many different discussions. What is snow made of? What color is the water (“mirror color” was one response I heard!). What is a puddle? If snow melts into water, what happens to the water? Why is there still snow in some places in our backyard, and none in other places? Why is there so little water in the jar when it was filled to the top with snow? What are those “black specks” in the water? What will happen to the water in the jar over time? Take a walk. 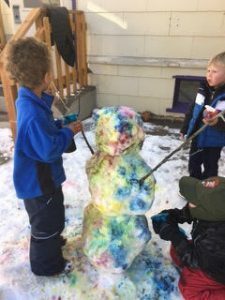 In Ezra Jack Keat’s classic book, Snowy Day, the boy experiments making tracks, drags a stick in the snow, makes angels and best of all, he puts a snowball in his pocket when he comes back inside. Your child may not want to put one in his/her pocket, but I highly recommend that you put one in yours! 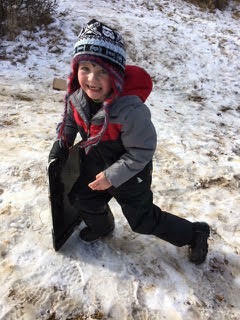 What fun for a child to watch your pocket and see what happens with you and the snow as the snow melts. And be sure to sing this fun song introduced to me by our M3 teacher, Kristin. Don’t be afraid to make up your own tune, or recite it like a poem if you’re not an adventurous singer. Simple props can be great fun with this song. Children can pretend a tissue is a cloud and tear it up. A rectangle of white paper can be a feather tossed up into the air. Special thanks to Kristin, and to Diane McCrae who taught Kristin the song! 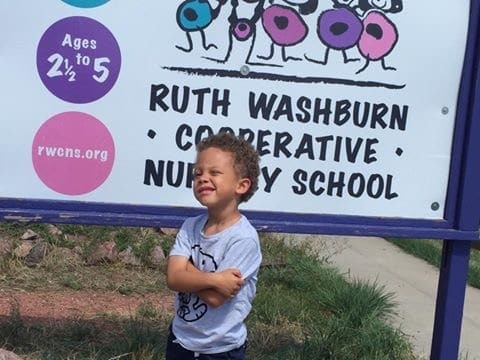 I laugh when I think of the expectations my husband and I had for our first child, Kenji, as he started school at Ruth Washburn. We wanted the perfect preschool and the perfect teacher. One of our biggest expectations was that he have perfect friends and be perfectly well adjusted himself, off on his way to being a happy, productive human being. Reality set in the very first day of school. 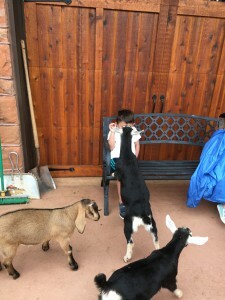 Our son was terrified. He did not want to be left and when I finally managed to pry myself away from him and get out the door, he and I were both in tears. We talked with the school director who assured us that Kenji’s reaction to school and our anxiety were both normal. 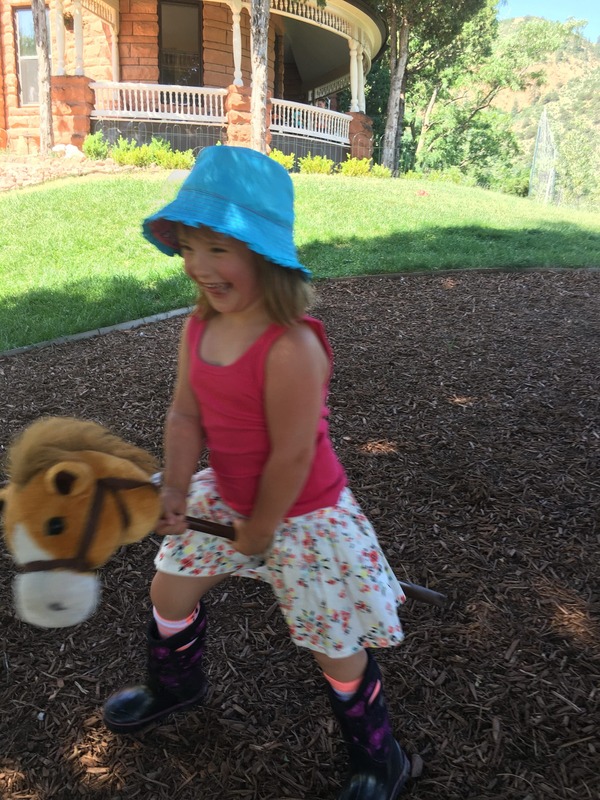 She had supported other families as they overcame this challenge. Knowing this was reassuring. Kenji’s classroom teacher had great suggestions. Have him arrive a little bit early each day, before children were engaged in play, so that he wouldn’t have to break into already established groups. I should avoid long and drawn out good-byes but simply reassure Kenji that I would be back to pick him up. He could bring a favorite animal or blanket from home to leave in his cubby. And she asked us about Kenji’s favorite interests at home so she could have some familiar and favorite toys out for him. I was finally able to see this school challenge as a problem we could work through and learn from. 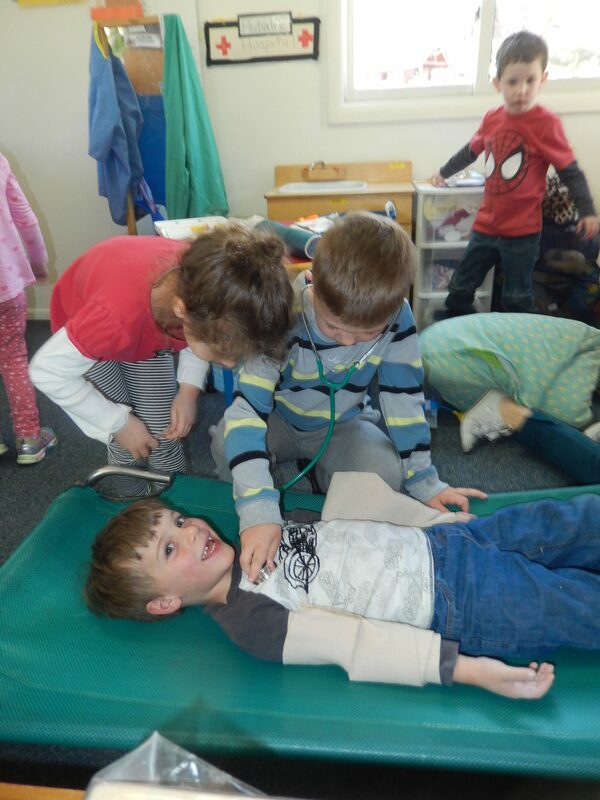 Although Kenji’s adjustment was a gradual process that took many weeks, he was eventually stomping around the classroom like a dinosaur and sharing large wooden blocks with his classmates. 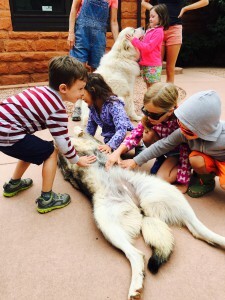 School life for Kenji and our two daughters has never been perfect. All three children have faced many less-than-perfect situations. 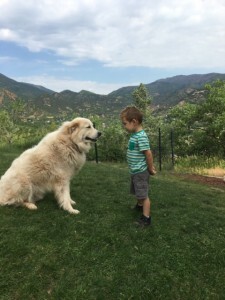 Having dealt successfully with Kenji’s difficult adjustment to preschool gave my husband and me the confidence to work through these problems with our children and to recognize that good things can come from the problem solving process. I have learned. There is no perfect school, perfect teacher, perfect friend, nor perfect son. It felt and feels so much better, as a parent, to spend less time in life looking for perfect—and more time making less-than-perfect situations better. 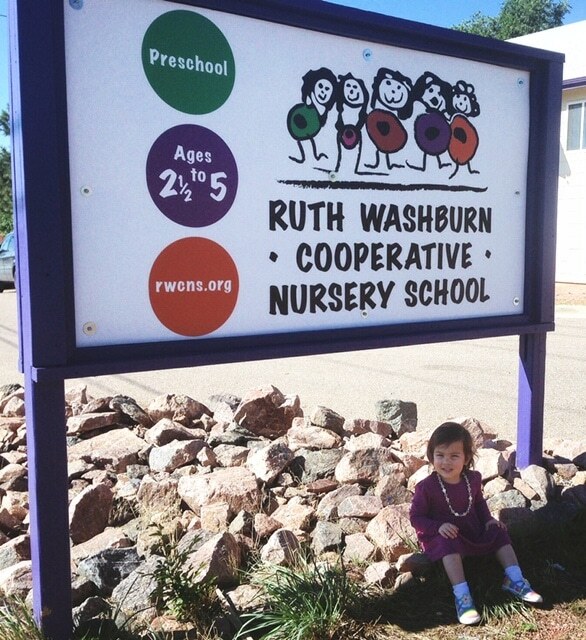 Having said all that, I do think that Ruth Washburn Cooperative Nursery School is the perfect imperfect school, if that makes sense! Old favorite songs are, well, old favorites for a reason. At Farm Camp our mandolin players Gail and Madison Stuart suggested we sing “Old MacDonald.” Since many children already know the words to this song, we enthusiastically sang “Old Mac Donald Had a Farm, E-I-E-I-0.” The fun began when children playfully added their own verses and sounds. 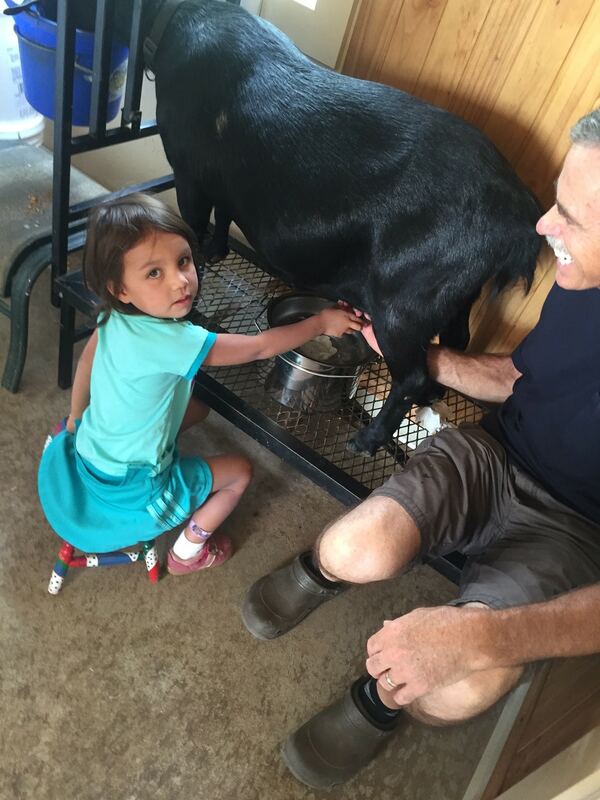 At first children suggested the usual farm animals. 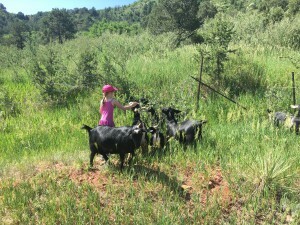 We did cows and pigs. And since we had been spending time with goats, the “maa, maas” here and everywhere sounded like the actual animal. Then camper Erin suggested that “on his farm he had some campers” so we sang her verse which children thought was hilarious! And on his farm he had some campers. E-I-E-I-O. And so on. The children continued with other creative suggestions. There are many books that play off this familiar tune and song. 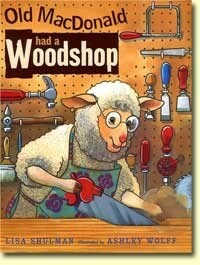 My favorite is Old MacDonald Had a Woodshop by Lisa Shulman. Not only is MacDonald a woman, but she is a sheep. Instead of a farm she has her woodshop. 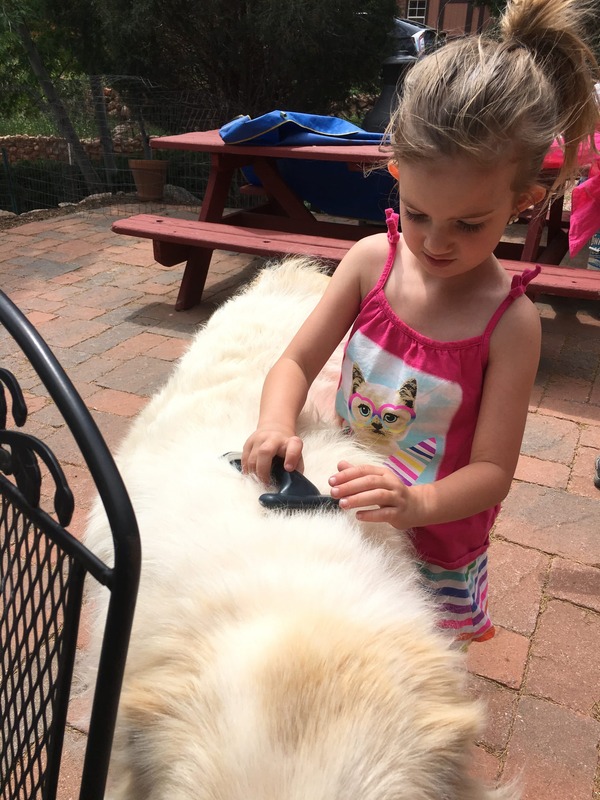 Instead of animals, she has tools. Instead of animal sounds children can make the sounds of the variety of tools introduced in the book. 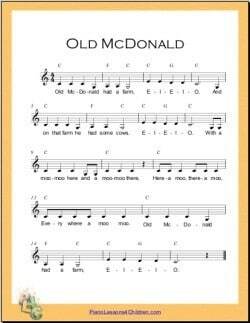 In any version of “Old Mac Donald” the famous and rousing chorus “E-I-E-I-O” offers a wonderful literacy opportunity. At school when we sing this song and read this book, I point to the letters as children sing. It’s the perfect way to introduce several letters of the alphabet. Children quickly learn these and can read as they sing along. Okay, there is one problem with old favorite songs, and in particular, “Old Mac Donald.” It gets stuck in your head. And that playful changing of the verses can start making you a little weird as you sing to yourself at the gas station and grocery store. But children are the masters of silliness and will love making up the sound for gas going into a car or coming up with the perfect sound that a head of kale would make—not to mention creating their own verses. So have some fun and sing old favorites with your child…(or to yourself!). 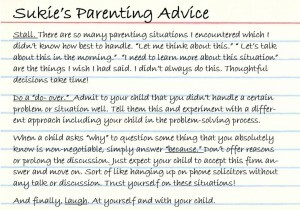 All the Parenting Advice You Need on a 3×5 Card? I do know that my parenting years are not over. How can I forget being 38 years old and getting in trouble with my wonderful dad for how I was raising my three-year-old daughter? So as my adult children grow older, and have children of their own, I’m sure I’ll be adding more advice to my short-list. But for now, here it is! Give it a try and let me know what I’ve forgotten.